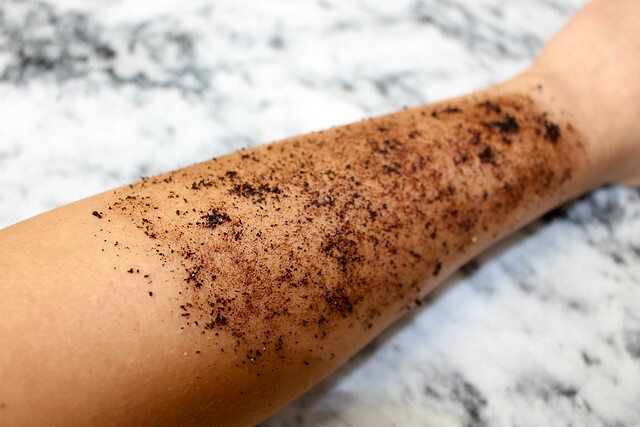 Coffee scrubs seem to be everywhere lately. The world has finally woken up to the wonders that coffee can do for your skin and they’re mad for it. But amongst the vast choice, what makes a scrub stand out? Enter Optiat. 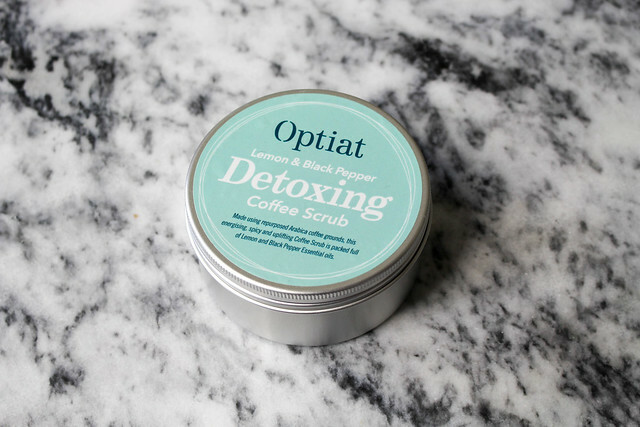 A London based business providing gorgeous and most importantly, sustainable coffee scrubs. 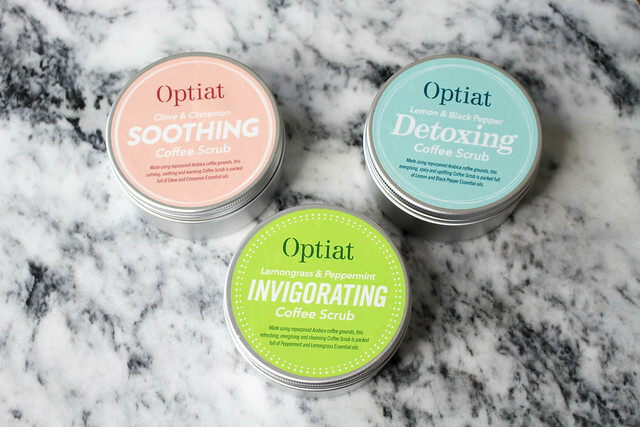 The beauty and skincare scene has been long overdue an ethical makeover, and thanks to brands such as Optiat word is finally getting through to people that you can have great products and be kind to the environment. They very kindly sent their three scrubs to me to try out and I don’t think I have ever loved a scrub so much! They are all so rich and nourishing. This stimulating and energising scrub has to be my favourite. It’s so refreshing thanks to the lemongrass and peppermint essential oils, a perfect way to start your day (or end it, if you wish!). It also has it’s base of Arabica coffee, brown sugar, Himalayan salt, sweet almond and sunflower seed oils along with the essential Vitamin E.
This ultra calming blend is a great chill out tool. It’s warm spicy fragrance is a hug in a scrub! Adding this to your night time routine will help your mind relax, readying you for a good night’s sleep. This scrub feels so cleansing to use, like a reset for your skin. Another energising and mind focusing skin treat, it would be great for when your skin is looking a bit tired. An attempt to show you the texture! I’ve made my own scrubs in the past using my old coffee grounds, but having such a good product available makes the option to buy it rather than spending the time and effort a lot more appealing. This is especially so where Optiat’s coffee is sustainably sourced, and I’d feel better knowing that my money would be going to people who know to look after their environment. 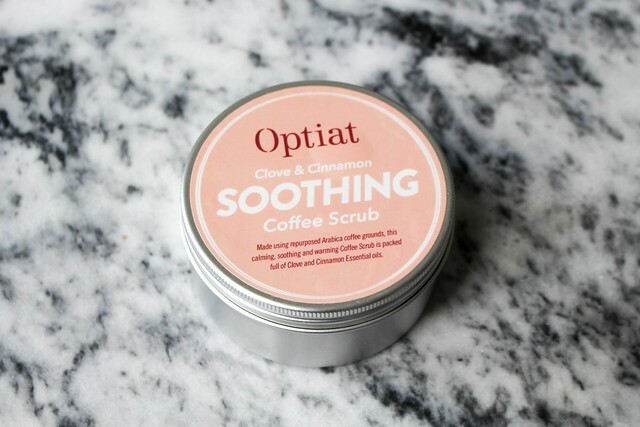 Coffee is well known for it’s cellulite smoothing properties, and whilst I can’t say mine has all magically gone in the two weeks I’ve been using them there is definitely a noticeable difference in the smoothness of my skin. I’m eager to see the continued results on my tummy area, as losing a lot of weight isn’t too kind on tummy skin. Also, a tip: Coffee grounds can clog up old drains, so cut a circle out of a coffee filter to put in your shower drain to catch most of them. My skin is incredible after using these scrubs over the past two weeks. The hydrating Vitamin E and sweet almond oil are so hydrating and nourishing, it’s a real pamper as well as a regular use product. The Himalayan salt it contains helps fight against any nasties on your skin as it’s a natural antiseptic, so it’s safe to gently use on scratched skin (playful cat owners I’m looking at you!). The sugar just adds an extra bit of ‘oomph’ to exfoliation. 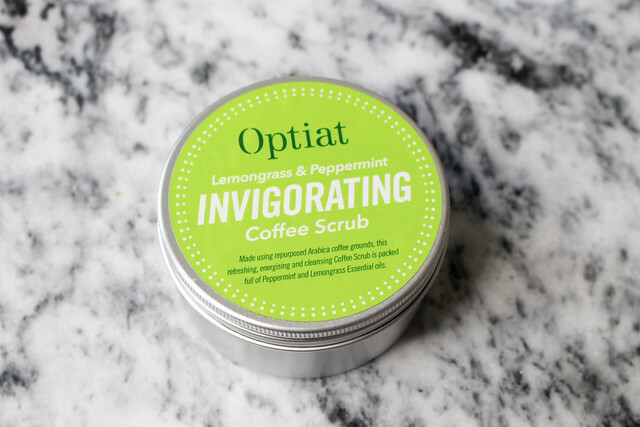 You can buy Optiat’s scrubs directly from their website, here. Do you have a favourite eco friendly skincare/beauty product? What products would you like to see made greener?